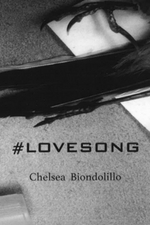 In her second book, #LOVESONG, Chelsea Biondolillo once again shows that is possible to be both a scientist and a writer. Shattering preconceived notions of love, she instead expresses its more grittier and imperfect faces. Using pieces of history from past relationships, she combines these with her beautiful micro prose alongside bold images of birds in order to create a beautiful blend of love, death, and science. Etchings Press: Why birds? We’ve repeatedly seen connections between love and birds in literature, but you focused on dead birds. Why? Chelsea Biondolillo: Birds fascinate me, and I write about them often. I’ve looked for them in the wild and in zoos and all over the world. I’ve held a live hummingbird, a dying vulture, and a terrified chicken (by the leg), and in grad school, I had an opportunity to skin song birds for the vertebrate collection at the university. It was a fascinating process and because I take pictures of everything, I took pictures in the lab. In the environment, birds are rarely still. They are hard to catch in binoculars, hard to photograph, hard to shoot, if shooting them is your thing. Catching that chicken by the leg was hard as hell. We consider, in fact, how much more a bird in the hand is worth, than possible birds, because getting a bird into your hand is tough. So these motionless birds on the table or in the palm of my hand became very interesting as subjects. Once I’d started taking pictures of dead birds in the lab, I began to photograph them out in the world when I came upon them. Why do I correlate them to all my ex-boyfriends? It started over a conversation that I was having on social media with a poet-editor friend. She was in the process of soliciting work from me and as we spoke, I brainstormed ways to combine an assortment of disparate elements that I’d been playing with for some time. EP: The pictures are incredibly specific, and they all seem like they were taken on serendipitous occasions. How did this all come together? CB: I have a degree in photography, and I take pictures nearly every day. The lab pictures, of in-process or prepared skins, all came about while I volunteered at the vertebrate collection for the University of Wyoming. The other photographs are from walks. I walk everywhere I can, and the more you walk around, the more bird death you’ll see. I try to get pictures of as many of them as I can. After awhile, it occurred to me that I probably had a lot of dead bird pictures and I started mulling over what I could do with them. I have other “collections” of images (street signs, images of my feet walking, black & white still lifes, bowls of soup, horizons), and other collections of texts (flash essays about dead animals, notes on my phone, a variety of lists and series of lists), and I am often mulling one or more of these collections over trying to envision the series as an object of some kind. When I hit upon pairing what was initially just the bird photos with found texts, I was excited and my writer friend was excited, and I was buoyed by it. This is why I value my writer friends and heroes. I am supported, inspired, and pushed by my virtual writing community. EP: Some of the found texts name you specifically. What’s the backstory there? Like the ones from 1986, did you save those for years? The only backstory is that I keep damn near everything because you never know when it might be needed again. EP: How does your writing and your history in environmental studies come together? Though this collection is a clear example, how does it influence your inspiration? CB: I position myself as a body in the natural world in nearly every piece of writing I complete. Sometimes I write directly about the natural world and have researched a variety of ecological stories, but even my experimental writing circles around the ways in which the outside surrounds us, both literally and figuratively. We are shaped by natural forces and live among natural systems. My environmental studies have given me rich resources in the way of lenses, texts, imagery, and discovery to apply to my observations and experiences. EP: You classified your writing in this collection as “microprose.” Why make that specification? What difference does it make in the collection? CB: Much of the text in this collection that I wrote (as opposed to photographed or curated) was originally written on and for Twitter. The pieces were inspired by Creative Nonfiction magazine’s rolling #cnftweet contest, and several have been published by the magazine as part of their “Tiny Truths” feature. The first time I appeared in the magazine, I wondered what to call a tweet-as-essay. Flash essays can be 1200 words long, so that didn’t seem to suffice. After some crowd-sourcing, the term “microprose” seemed the most apt. In 2013, I participated in a round table discussion on tweet-length essays for Creative Nonfiction (a portion of which is online here), and during that conversation, I mentioned that I found 130 characters ideal for break up stories “that would become too maudlin with excessive words,” because “no one wants to read 3000 words on most people’s breakups. But to crystallize in 130 characters the moment when you knew you weren’t in love, and why, requires that most of the petty specificities be stripped.” A few of the pieces in #lovesong were just a bit too long for Twitter, so I’d tucked them away like so many old love notes and waited. EP: Do you have a favorite of the found texts you included? CB: Each one was my favorite, at one time. That’s how love works. Chelsea Biondolillo is the author of the prose chapbook, Ologies. Her work has appeared in Orion, Passages North, New Ohio Reivew, Brevity, Sonora Review, River Teeth, and other publications. Her essays have been anthologized in Best American Science and Nature Writing (2016) and Waveform: Twenty-first Century Essays by Women. 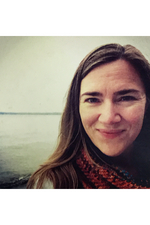 She is a former Olive B. O'Connor fellow and Hedgebrook resident, and she received her MFA in creative writing and environmental studies from the University of Wyoming.